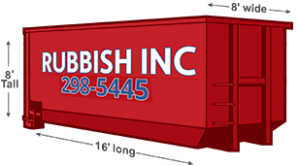 Whether you a have a few trees you need hauled off or some assistance with cleaning up your property, RUBBISH INC™ offers the hauling, man power, and containers to make it happen. You no longer have to buy all of those over sized Home Depot bags to legally dispose of your yard waste. RUBBISH INC™ debris removal will clear your home and property of yard waste and trash in one quick drive by, minus the headache of filling bag after bag. In the event you need a two man crew to cut some trees down or trim some bushes or simply bag up the cuttings you’ve already produced yourself, no problem. Call us, fill us in, and we will provide you with the best and most convenient solution at an affordable flat rate price. Trust me, we’ve done it all. Our business is backed by a lineage of experience in many fields of trash hauling. Some individuals or families will need our containers for properties ranging from an acre to 100 acres. We are absolutely your best option for this type of rubbish hauling. We will empty your dumpster as many times as you like no matter the time of day. Our theory is time is money, and we intend to maximize your use of time as you see fit and support you along the way. Some projects can’t wait, and we understand. That said, we offer our junk removal services 24 hours a day, 7 days a week. Call us for any of your special needs or requests. All in all, our family like approach to business will leave you with a smile on your face. We want your business. Give us a call and let the cleanup begin!